Human serum albumin (HSA) is a protein, which is purified from human blood and is commonly used in cell and tissue culture media, including media for human gametes and embryos. The role of albumin in culture media is diverse and not always fully understood. In this blog post, I will describe the role of albumin and what the big deal is for its use in IVF laboratories. Albumin in the culture media acts as a surfactant, preventing embryos and gametes from sticking to consumables due to changes in the surface charge. Additionally, albumin can protect embryos from toxicity in the culture environment, act as a chelator and pH buffer (Gardner, 2008). With the development of more complex and physiologic media, high quality human albumin is one of the key components required to grow good quality, viable blastocysts. Albumin remains a critical component of modern culture media although its effect on outcomes can be overlooked. In the early days of IVF, culture media was typically supplemented with maternal or fetal cord serum to facilitate embryo development. These types of protein supplement was crude and not well defined and created unknown variables, including potential for Hepatitis B infections (Van Os et. al, 1991). Additionally, whole sera was associated with many documented adverse effects on animal embryos (Wale and Gardner, 2016). In modern times, the type of protein supplementation has evolved to human serum albumin (HSA), whether it be known-donor or recombinant derived. These types of protein proved to be equally effective to whole serum with a reduction in variability, but was still prone to lot-to-lot differences. Still present is the risk of potential disease transmission with the human derived albumin, although regulatory oversight and manufacturing methods have minimised the risks. Today, there are other protein supplements that include, in addition to human albumin, other factors such globulins (α and β) and potential other undefined compounds. One of the consequences of this type of formulation is the increase of ammonium in the culture media. The increase in ammonium has been shown to severely affect normal blastocyst development; negatively effecting metabolism and gene expression and even perhaps miscarriage rates (Gardner 2013, Kleijkers 2016.) This type of alternative albumin is available but is not internationally accepted and the potential for abnormal effects is real. The use of medical devices from human derived sources is highly regulated by international regulatory authorities (EU, USA, and Australia) to ensure patient safety. There are limited sources of high quality human albumin. Even more limiting are sources of human albumin that meet regulatory requirements for all major markets for global distribution. These limitations make sourcing high quality human albumin, which can be used in human IVF culture media, extremely difficult. How is albumin used in IVF culture media? The typical concentration of human albumin in IVF culture media is between 5 mg/ml and 10 mg/ml, depending on the manufacturer’s specification for a certain product. The concentration of the human albumin used in artificial reproductive technology (ART) is based on research and clinical validation. In general, human albumin will be added by the manufacturer (i.e. G-1 Plus or G-TL) to produce a product that is ready to use in the IVF laboratory. In certain cases, culture media is produced without the addition of albumin or by the embryologist (i.e. 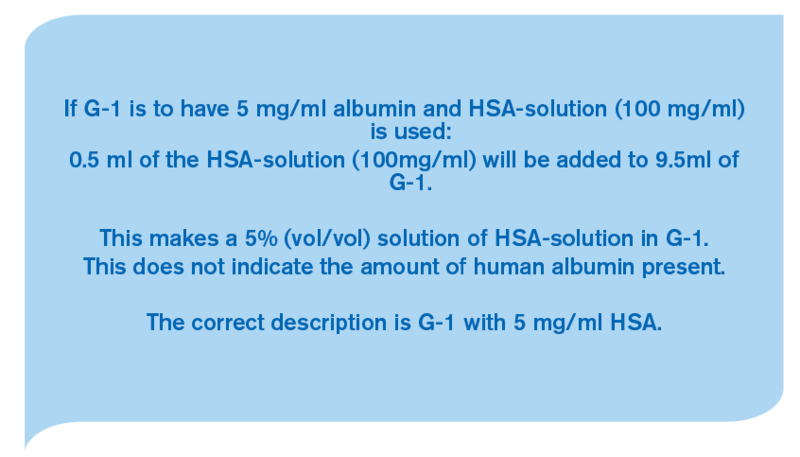 G-1 with the addition of HSA-solution) and can be supplemented by the embryologist. Let us go back to basics of chemistry 101! It is very common to discuss protein supplementation in terms of percentage (vol/vol), but this is not correct. When we reference the amount of protein in the culture media, it should be based on the concentration within the final solution (wt/vol) and not the volume of a stock solution added. In order to make a solution at the correct albumin concentration a specific volume of human albumin solution is added to a specific volume of culture media. The concentration of the human albumin is the critical element, not the amount of solution added. It is better use of our chemistry training to refer to the supplemented culture media in terms of albumin concentration rather than volume of added solutions. When manufacturing culture media for IVF, the composition will be optimised for all the components in that formulation based on the manufacturers specification of the medical device in question. This formulation must be validated and approved by regulatory authorities to be sold as a medical device. In basic terms, this means that the optimal specification for pH and osmolality for a media is based on the intended use as a final solution. When the lab decides to change the suggested albumin concentration of that media, they are altering the composition and may create a new solution, with an altered pH or osmolality, which may potentially cause the culture media to be out of specification. 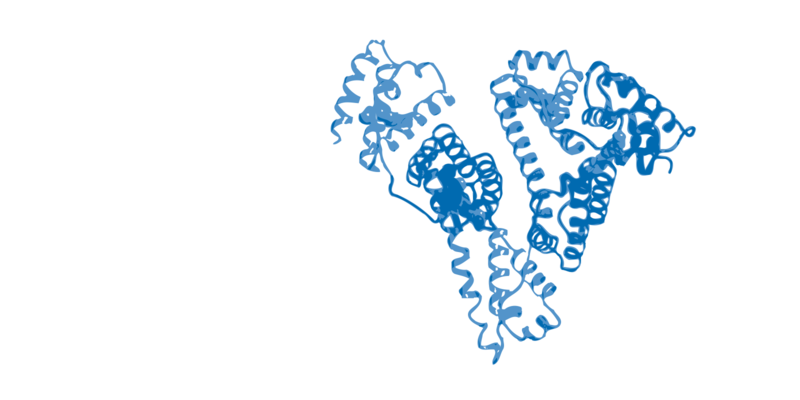 It is therefore critical to understand how human albumin solutions are composed, as not all are the same. If one alters the composition of a medical device, it is being used “off label” and not as intended by the manufacturer and now is a new medical device that is not recognised by regulatory authorities which, in some regions, is in violation of the law. It is surprisingly common for IVF laboratories to alter culture media but it is important that the lab understands how changing that media may affect their clinical success. They are also then responsible for ensuring safety for the patient and taking responsibility for altered media performance. Manufacturing medical devices is a regulated process for all major global ART markets. The specification and composition of a medical device is approved for sales based on the manufactures validation of that device and often based on clinical performance. Altering medical devices does create a new device, which is being used “off label” and at the sole risk of the customer. It is important to understand the impact of altering the composition of a medical device, which might affect your clinical results and create unwanted risks, such as improper media composition or regulatory consequences. Gardner, D. Dissection of culture media for embryos: the most important and less important components and characteristics. Reproduction, Fertility and Development. 2008; 20, 9–18. Gardner DK, Hamilton R,McCallie B, SchoolcraftWB, Katz-JaffeMG. Human and mouse embryonic development, metabolism and gene expression are altered by an ammonium gradient in vitro. Reproduction 2013;146:49–61. Kleijkers SH, van Montfoort AP, Bekers O, Coonen E, Derhaag JG, Evers JL, et al. Ammonium accumulation in commercially available embryo culture media and protein supplements during storage at 2–8 degrees C and during incubation at 37 degrees C. Hum Reprod. 2016;31: 1192–9. Van Os H, Drogendijk A, Fetter W, Heijtink R, Zeilmaker G. The influence of contamination of culture medium with hepatitis B virus on the outcome of in vitro fertilization pregnancies. American Journal of Ob and Gyn. 1991;165 (1), 152–159. Wale, P, Gardner DK. The effects of chemical and physical factors on mammalian embryo culture and their importance for the practice of assisted human reproduction Human Reproduction Update. 2016; 22(1) 2–22,. Blake D, Svalander P, Jin M, Silversand C, Hamgurger L. Protein Supplementation of Human IVF Culture Media. Journal of Assisted Reproduction and Genetics. 2002; 19(3): 137–143. Brett is a key player in securing the highly appreciated Vitrolife quality. As the MEA Lab Manager he is responsible for making sure that only the best gets through our sensitive mouse embryo assay.